Many of us have heard the comparisons of painful things to the root canal procedure. It's not that bad. There are tiny canals within your tooth that may become infected. This leads to the pulp inside your tooth also becoming diseased. Either your dentist or an endodontist to remove any infection performs the root canal procedure. The canals are then filled and the tooth receives either a filling or a crown. Crowns are more common in most cases as they add strength to the tooth itself. 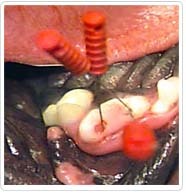 The procedure itself takes one to two visits. If your tooth is infected or there's severe damage to the pulp, a root canal will be recommended. An untreated cavity is the most common cause for this infection. The pulp inside the tooth can become inflamed from trauma or extensive restorative work. It can even be affected from a series of fillings being applied in a short period of time. This inflammation usually leads to infection. Pain in the tooth is the most common and obvious symptom.